Wiretapping also known as telephone tapping is away for certain individuals to monitor the activities of another via telephone or internet. This is usually accomplished through covert means and gives a listener the advantage of being a “fly on the wall”. This type of covert listening received its name from its early origins. During the early days of wiretapping the monitoring connection was established by an electrical tap on the line. The government has a long history of making use of wiretapping to help take down criminals and terrorists. The United States government does have the power to listen in to certain people’s telephone conversations as well as email messages. This is called lawful interception and is usually because of some warranted suspicions. In a vast majority of cases before a line can be tapped, it must be cleared by a court. If wiretapping is conducted without going through the proper channels this offense can be considered an criminal act. However in the United States depending on the severity of the issue a government body can be authorized without going through all of the channels. Any telephone call can be recorded by a party, but according to constitutional law both parties must be aware of it. 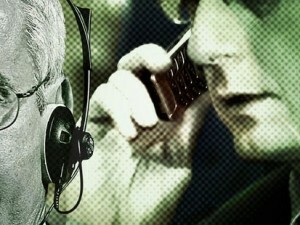 There are various ways that a phone call can be tapped. In most cases one of the parties will record the phone call by using a tape recorder or some online voice recording software. In some cases an induction coil will be placed underneath a telephone for remote access to the conversation. With an electrical connection a tap on the line can be made from anywhere in the vicinity of the line. Cheaper wiretaps typically have a host of problems such as: poor detection and frequently dropped calls. This can be avoided simply by purchasing the best quality taps that will allow the user to listen into a conversation from a few kilometers away. These devices are incredibly powerful and can give people the power to spy on others. This is especially true in business. Though spying tactics are usually illegal in business, these happenings still occur. If you feel and suspect that your business or phone is being tapped there are some solutions for you. There are some methods of wiretap detection that will enable you to sweep your home or office for tracking bugs. There are also bug detection services and teams that will come to your office or home and get rid of them for you. These services can be extremely beneficial for the safety and security of your home or office. Wiretaps have a long history of use in different parts of the world. These devices allow government and private agencies to keep tabs on various groups. Sometimes these wiretaps can be used for more nefarious purposes like business scandals. To avoid this from happening it is good to find a sweep team that will detect any wiretaps that are located in a home or office. My name is Ryan O’Hare and I am a ex surveillance team sweeper. During my thirty years employed I have experienced all different types of ploys designed to help business spy on one another. One thing I do know is that www.bugged.com is one of the best sites to visit for great information on bugs and wiretap detection devices. These can really be a big help to those who are looking for more security for their office or home.